Advanced Inner Grail Pilgrimage... into the Heart of the Ancient Pre-Celtic ways of Land & Sea... Sun & Moon... Gods & Goddesses. This journey will be steeped with potent energy while pilgrimaging on ancient and sacred dragon lines/acupuncture points. We are being drawn to go deeper than ever before, to remote areas where the energies are pure and untouched and even un-visited. 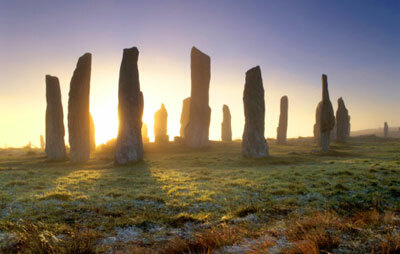 We will visit little known sites that energies will surpass the most famous sites like Stonhenge etc. We will be honoring the pristine new energy of Oneness and the Vision of Paradise while reclaiming and evolving our ancient heritage so we can build a new world. We honor the ancient Goddesses, the original Maidens, and the Graceful Guardians of the Grid. We also equally honor all the Kings, Knights, Guardians of Chivalry, and protectors of the Holy Grail within us all. This year we are being called to Sacred Sites in the Scottish Highlands and Isles, including Rosslyn Chapel, Magical Kilmartin Valley, Isle of Mull, Isle of Iona, and the Outer Hebrides Islands and The Callanish Stones. We are going in DEEPER into the Myths and Magic . . . and will be adding surprises and magic. 4 Spaces left and feel spirit is holding them for someone...maybe you!